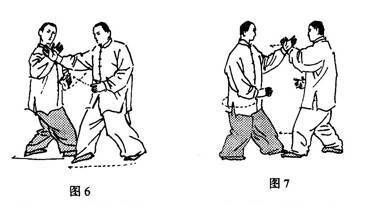 Ba Gua Rolling Hands exercises are akin to Tai Ji Quan’s Pushing Hands. 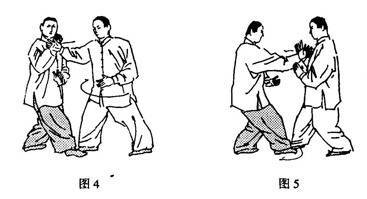 The first of the Liang Style Ba Gua Eight Rolling Hands Exercises is the Hip Sucking Palm. Main Points: Drop the shoulders, sink the yao and relax the whole body. Main Points: Drop the shoulders and elbows, relax the whole body and shift the weight on the posterior leg. Main Points: There must be coordination between the movements of the palm and leg. Main Points: When B takes in the hip and turns the low back and knee to dissolve A’s attacking force, it depends upon A’s pushing and rotating force. Main Points: When A takes in the hip to move the low back and knee for dissolving B’s attacking force, it depends upon B’s pushing and rotating force. Main Points: Step forward while A pushes B, and the movements should be coordinated. 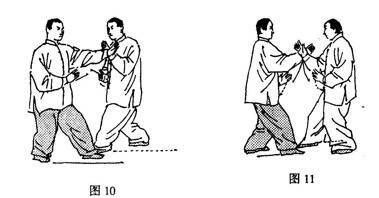 Main Points: When both A and B step forward and walk backward touching each others’ wrists, the movements should be in coordination and the force should be unified, without stiff force or resistance. Main Points: When A takes in the hip and turns the low back and knee to dissolve B’s attacking force, it depends upon B’s pushing and rotating force. Main Points: Step forward while B pushes A, and the movements should be in coordination. Main Points: Drop the shoulders, sink the low back, relax the whole body and maintain a smooth respiration. 棚 Peng (Beng): Translated as “arrow quiver.” This character is usually Romanized as Peng. It is an obscure word that may connote an opening up or a moment of releasing, like pulling a cork from a bottle. It may also have something to do with the sounds these actions involve. Here Peng is followed by the character for “transformation” (Hua). 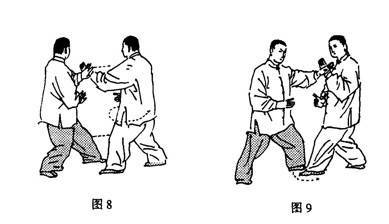 The oppoents’ attack is transformed or dissolved using Peng Jin.